What is coronary artery bypass graft (CABG) surgery? How is CABG surgery done? How do patients recover after CABG surgery? What are the risks and complications of CABG surgery? What are the long-term results after CABG surgery? How do CABG surgery and angioplasty (PTCA) compare? 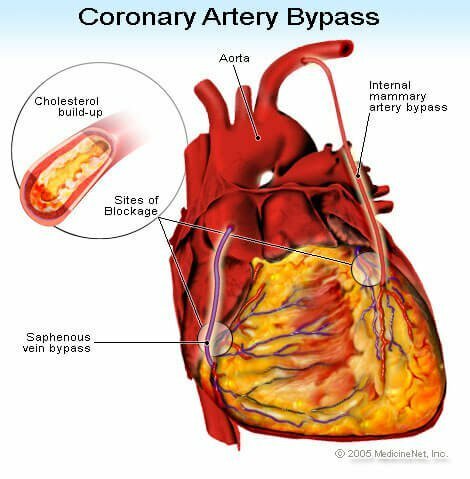 Coronary artery disease develops because of hardening of the arteries (arteriosclerosis) that supply blood to the heart muscle. In the diagnosis of coronary artery disease, helpful tests include EKG, stress test, echocardiography, and coronary angiography. Coronary artery bypass graft (CABG) surgery reestablishes sufficient blood flow to deliver oxygen and nutrients to the heart muscle. The bypass graft for a CABG can be a vein from the leg or an inner chest wall artery. According to the American Heart Association, coronary artery bypass graft (CABG) surgeries are among the most commonly performed major operations. CABG surgery is advised for selected groups of patients with significant narrowings and blockages of the heart arteries (coronary artery disease). CABG surgery creates new routes around narrowed and blocked arteries, allowing sufficient blood flow to deliver oxygen and nutrients to the heart muscle. 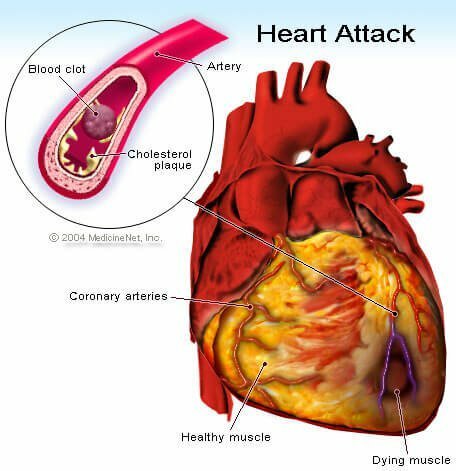 Coronary artery disease (CAD) occurs when atherosclerotic plaque (hardening of the arteries) builds up in the wall of the arteries that supply the heart. This plaque is primarily made of cholesterol. Plaque accumulation can be accelerated by smoking, high blood pressure, elevated cholesterol, and diabetes. Patients are also at higher risk for plaque development if they are older (greater than 45 years for men and 55 years for women), or if they have a positive family history for early heart artery disease. The atherosclerotic process causes significant narrowing in one or more coronary arteries. When coronary arteries narrow more than 50 to 70%, the blood supply beyond the plaque becomes inadequate to meet the increased oxygen demand during exercise. The heart muscle in the territory of these arteries becomes starved of oxygen (ischemic). Patients often experience chest pain (angina) when the blood oxygen supply cannot keep up with demand. Up to 25% of patients experience no chest pain at all despite documented lack of adequate blood and oxygen supply. These patients have "silent" angina, and have the same risk of heart attack as those with angina. When a blood clot (thrombus) forms on top of this plaque, the artery becomes completely blocked causing a heart attack. When arteries are narrowed in excess of 90 to 99%, patients often have accelerated angina or angina at rest (unstable angina). Unstable angina can also occur due to intermittent blockage of an artery by a thrombus that eventually is dissolved by the body's own protective clot-dissolving system. The resting electrocardiogram (EKG) is a recording of the electrical activity of the heart, and can demonstrate signs of oxygen starvation of the heart (ischemia) or heart attack. Often, the resting EKG is normal in patients with coronary artery disease and angina. Exercise treadmill tests are useful screening tests for patients with a moderate likelihood of significant coronary artery disease (CAD) and a normal resting EKG. These stress tests are about 60 to 70% accurate in diagnosing significant CAD. If the stress tests do not reveal the diagnosis, greater accuracy can be achieved by adding a nuclear agent (thallium or Cardiolite) intravenously during stress tests. Addition of the nuclear imaging agent allows imaging of the blood flow to different regions of the heart, using an external camera. An area of the heart with reduced blood flow during exercise, but normal blood flow at rest, signifies significant artery narrowing in that region. Combining echocardiography (ultrasound imaging of the heart muscle) with exercise stress testing (stress echocardiography) is also a very accurate technique to detect CAD. When a significant blockage exists, the heart muscle supplied by this artery does not contract as well as the rest of the heart muscle. Stress echocardiography and nuclear stress tests are both at least 80% to 85% accurate in detecting significant coronary artery disease. When a patient cannot undergo exercise stress test because of nervous system or joint problems, medications can be injected intravenously to simulate the stress on the heart due to exercise and imaging can be performed with a nuclear camera or ultrasound. Cardiac catheterization with angiography (coronary arteriography) is the most accurate test to detect coronary artery narrowing. Small hollow plastic tubes (catheters) are advanced under X-ray guidance to the openings of the two main heart arteries (left and right). Iodine contrast, "dye," is then injected into the arteries while an X-ray video is recorded. A newer modality, high speed CT scanning angiography has recently become available. This procedure uses powerful X-ray methods to visualize the arteries to the heart. Its role in the evaluation of CAD is currently being evaluated. For more, please read the CT Scanning Angiography article. Medicines used to treat angina reduce the heart muscle demand for oxygen in order to compensate for the reduced blood supply. Three commonly used classes of drugs are the nitrates, beta blockers and calcium blockers. Nitroglycerin (Nitro-Bid) is an example of a nitrate. Examples of beta blockers include propranolol (Inderal) and atenolol (Tenormin). Examples of calcium blockers include amlodopine and felodopine. Unstable angina is also treated with aspirin and the intravenous blood thinner heparin. Aspirin prevents clumping of platelets, while heparin prevents blood clotting on the surface of plaques in a critically narrowed artery. When patients continue to have angina despite maximum medications, or when significant ischemia still occurs with exercise testing, coronary arteriography is usually indicated. Data collected during coronary arteriography help doctors decide whether the patient should be considered for percutaneous coronary intervention, or percutaneous coronary intervention (PCI), whereby a small stent is used to open up the blockage. Angioplasty can produce excellent results in carefully selected patients. Under X-ray guidance, a wire is advanced from the groin to the coronary artery. A small catheter with a balloon at the end is threaded over the wire to reach the narrowed segment. The balloon is then inflated to push the artery open, and a stent is inserted. CABG surgery is performed to relieve angina in patients who have failed medical therapy and are not good candidates for angioplasty (PCI). CABG surgery is ideal for patients with multiple narrowings in multiple coronary artery branches, such as is often seen in patients with diabetes. CABG surgery has been shown to improve long-term survival in patients with significant narrowing of the left main coronary artery, and in patients with significant narrowing of multiple arteries, especially in those with decreased heart muscle pump function. The cardiac surgeon makes an incision down the middle of the chest and then saws through the breastbone (sternum). This procedure is called a median (middle) sternotomy (cutting of the sternum). The heart is cooled with iced salt water, while a preservative solution is injected into the heart arteries. This process minimizes damage caused by reduced blood flow during surgery and is referred to as "cardioplegia." Before bypass surgery can take place, a cardiopulmonary bypass must be established. Plastic tubes are placed in the right atrium to channel venous blood out of the body for passage through a plastic sheeting (membrane oxygenator) in the heart lung machine. The oxygenated blood is then returned to the body. The main aorta is clamped off (cross clamped) during CABG surgery to maintain a bloodless field and to allow bypasses to be connected to the aorta. The most commonly used vessel for the bypass is the saphenous vein from the leg. Bypass grafting involves sewing the graft vessels to the coronary arteries beyond the narrowing or blockage. The other end of this vein is attached to the aorta. Chest wall arteries, particularly the left internal mammary artery, are now commonly used as bypass grafts. This artery is separated from the chest wall and usually connected to the left anterior descending artery and/or one of its major branches beyond the blockage. The major advantage of using internal mammary arteries is that they tend to remain open longer than venous grafts. Ten years after CABG surgery, only 66% of vein grafts are open compared to 90% of internal mammary arteries. However, artery grafts are of limited length, and can only be used to bypass diseases located near the beginning (proximal) of the coronary arteries. Using internal mammary arteries may prolong CABG surgery because of the extra time needed to separate them from the chest wall. Therefore, internal mammary arteries may not be used for emergency CABG surgery when time is critical to restore coronary artery blood flow. CABG surgery takes about four hours to complete. The aorta is clamped off for about 60 minutes and the body is supported by cardiopulmonary bypass for about 90 minutes. The use of 3 (triple), 4 (quadruple), or 5 (quintuple) bypasses are now routine. At the end of surgery, the sternum is wired together with stainless steel and the chest incision is sewn closed. Plastic tubes (chest tubes) are left in place to allow drainage of any remaining blood from the space around the heart (mediastinum). About 5% of patients require exploration within the first 24 hours because of continued bleeding after surgery. Chest tubes are usually removed the day after surgery. The breathing tube is usually removed shortly after surgery. Patients usually get out of bed and are transferred out of intensive care the day after surgery. Up to 25% of patients develop heart rhythm disturbances within the first three or four days after CABG surgery. These rhythm disturbances are usually temporary atrial fibrillation, and are felt to be related to surgical trauma to the heart. Most of these arrhythmias respond to standard medical therapy that can be weaned one month after surgery. The average length of stay in the hospital for CABG surgery has been reduced from as long as a week to only three to four days in most patients. Many young patients can even be discharged home after two days. A new advance for many patients is the ability to do CABG without going on cardiopulmonary bypass ("off pump"), with the heart still beating. This may significantly minimize the occasional memory defects and other complications that may be seen after CABG, and is a significant advance. Sutures are removed from the chest prior to discharge and from the leg (if the saphenous vein is used) after 7 to 10 days. Even though smaller leg veins will take over the role of the saphenous vein, a certain degree of swelling (edema) in the affected ankle is common. Patients are advised to wear elastic support stockings during the day for the first four to six weeks after surgery and to keep their leg elevated when sitting. This swelling usually resolves after about six to eight weeks. Healing of the breastbone takes about six weeks and is the primary limitation in recovering from CABG surgery. Patients are advised not to lift anything more than 10 pounds or perform heavy exertion during this healing period. They are also advised not to drive for the first four weeks to avoid any injury to the chest. Patients can return to normal sexual activity as long as they minimize positions that put significant weight on the chest or upper arms. Return to work usually occurs after the six week recovery, but may be much sooner for non-strenuous employment. Exercise stress testing is routinely done four to six weeks after CABG surgery and signals the beginning of a cardiac rehabilitation program. Rehabilitation consists of a 12 week program of gradually increasing monitored exercise lasting one hour three times a week. Patients are also counseled about the importance of lifestyle changes to lower their chance of developing further CAD. These include stopping smoking, reducing weight and dietary fat, controlling blood pressure and diabetes, and lowering blood cholesterol levels. Mortality may be higher in women, primarily due to their advanced age at the time of CABG surgery and smaller coronary arteries. Women develop coronary artery disease about 10 years later than men because of hormonal "protection" while they still regularly menstruate (although in women with risk factors for coronary artery disease, especially smoking, elevated lipids, and diabetes, the possibility for the development of coronary artery disease at a young age is very real). Women are generally of smaller stature than men, with smaller coronary arteries. These small arteries make CABG surgery technically more difficult and prolonged. The smaller vessels also decrease both short and long-term graft function. A very small percentage of vein grafts may become blocked within the first two weeks after CABG surgery due to blood clotting. Blood clots form in the grafts usually because of small arteries beyond the insertion site of the graft causing sluggish blood run off. Another 10% of vein grafts close off between two weeks and one year after CABG surgery. Use of aspirin to thin the blood has been shown to reduce these later closings by 50%. Grafts become narrowed after the first five years as cells stick to the inner lining and multiply, causing formation of scar tissue (intimal fibrosis) and actual atherosclerosis. After 10 years, only 2/3 of vein grafts are open and 1/2 of these have at least moderate narrowings. Internal mammary grafts have a much higher (90%) 10 year rate of remaining open. This difference in longevity has caused a shift in surgical practices toward greater use of internal mammary and other arteries as opposed to veins for bypasses. It has been shown that in CABG patients with elevated LDL cholesterol (bad cholesterol) levels, use of cholesterol-lowering medications (particularly the statin family of drugs) to lower LDL levels to below 80 will significantly improve long-term graft patency as well as improve survival benefit and heart attack risk. Patients are also advised about the importance of lifestyle changes to lower their chance of developing further atherosclerosis in their coronary arteries. These include stopping smoking, exercise, reducing weight and dietary fat, as well as controlling blood pressure and diabetes. Frequent monitoring of CABG patients with physiologic testing can identify early problems in grafts. PTCA (angioplasty) with stenting, in addition to aggressive risk factor modification, may significantly limit the need for repeat CABG years later. Repeat CABG surgery is occasionally necessary, but may have a higher risk of complication. Ongoing studies are comparing the treatment results of angioplasty (PTCA) versus bypass (CABG surgery) in patients who are candidates for either procedure. Both procedures are very effective in reducing angina symptoms, preventing heart attacks, and reducing death. Many studies have either shown similar benefits or slight advantage to CABG (primarily in severe diabetics). The best choice for an individual patient is best made by their cardiologist, surgeon, and primary doctor. References: American Heart Association, "Open-Heart Surgery Statistics"
American Heart Association, "Open-Heart Surgery Statistics"